Next review Empire Today - Windows!!!!!!!!!! Aug 21, 2010 Susan, thanks for posting the information on your experience with us, Iâ€™m sorry that we were unable to service you with our products and that there was a delay in the refund processing. I was able to have our Customer Service Team review the details on your account. We will be following back with the Local Market Sales Team on your experience and concerns that were expressed. Customer satisfaction is very important to us; we review every concern and if the customer is willing, work on a mutual resolution. I wanted to give you additional information regarding our promotions. Empire offers a variety of promotions and online specials, our Buy One Room get Two Rooms Free offer during the time you had your visit was on select styles of our Carpet and Flooring products and only covers the cost of the product, however with this promotions and also our other promotions and offers, certain conditions must be met to eligible for the receiving the offer. Once again, I do apologize for the service that you received and wish that we had the opportunity to service you for your flooring needs. If you have any questions, I would like to recommend that you contact, our National Customer Manager, Rebekah Clerk, at customersupport@empiretoday.com or call 888-588-2315 x4195. Bridget Moscatello, Vice President of Customer Care. I had Empire Today come out under their Buy 1 get 2 free campaigns. While the selection was good and I did find carpet and wood laminate flooring, the bait and switch occurred after I placed the order. First, the laminate was not covered under the campaign. However, I was "given" a 67% discount, which was supposed to make up for not being included. Then the quotes were given with no breakout for materials, labor, etc. I was given a "30 day" price and a "Install Tomorrow" price, with the "30 day" price being $350 more. I placed the order for "Install Tomorrow", but the more I thought about it, the more disturbed I got and wound up canceling the order the next day (2-20). After I cancelled the order, the salesman called back, stating that he had calculated that I needed 18 boxes of laminate, when in fact, I only needed 10. I wonder if that mistake would have been found out by the time I had to pay. However, I found out that Empire did not cancel the order until today (3-1), meaning that they will wind up keeping my deposit for an extra week. Empire did not provide detailed quotes in terms of room dimensions, cost of materials, labor, etc. Without details, it is impossible to do any kind of price comparisons. They also schedule the installation before the consumer deadline of 72 hours. I guess the expression "Buyer beware" applies to Empire. By "discounting" the install next day price, people do not have time to think or comparison shop and wind up thinking they got a good deal. 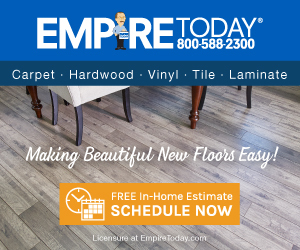 Product or Service Mentioned: Empire Today Flooring. Review #157631 is a subjective opinion of sbutzko. Thank you for bringing your sales experience to our attention. We apologize for any inconvenience, and our customer service team would like to work with you to explore a resolution. Please contact us at 800-588-2300 so we can assist you.